This uber compact, slim line starter kit from Joyetech is the perfect option for those just getting their first taste of the vaping world, lightweight and easily portable. Incorporating a tank and built in battery, this personal vape kit device features an all in one design, perfect for quick and easy vaping. 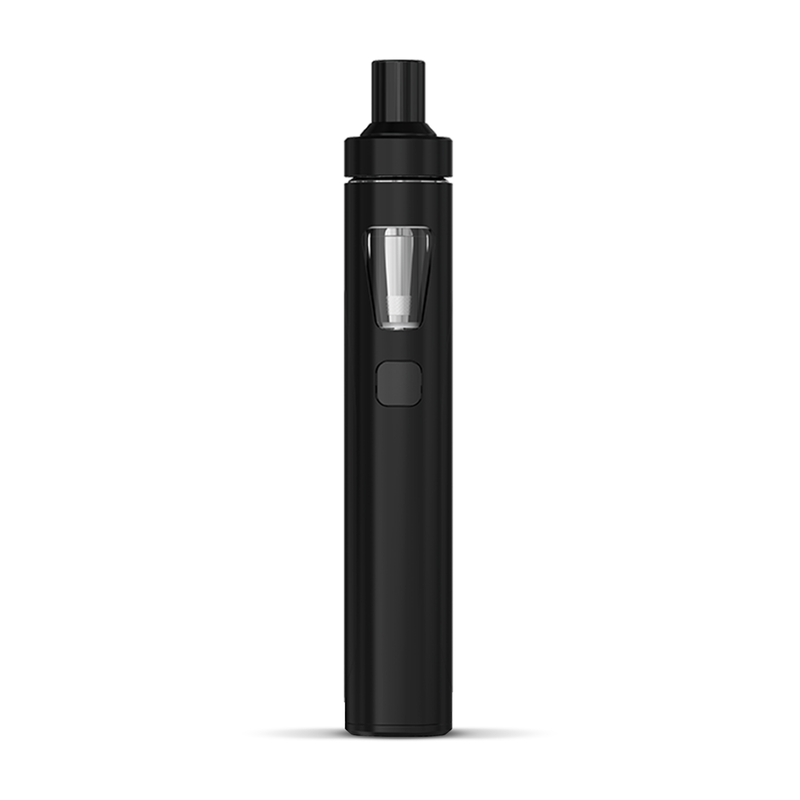 Containing clever and convenient leak resistant cup technology, as well as a child lock feature, this pen-style e-cig device is extremely safe and remarkably easy to use. Featuring a top fill system, leakage and spills are minimised. The built in battery has a capacity of 1500mAh, while the battery level display has a range of colour options, including red, blue, indigo, white or purple, allowing you to choose a colour best suited to your personality. The eGo AIO Vape Pen Kit from Joyetech softly introduces beginners into the world of vaping, making sure not to overwhelm them, slowly and steadily dipping their toes into the alluring vaping waters. Seems the same performance as old model, which I have liked for years. Difficult to fasten the lid after refilling, though I don't know why I'm having so much trouble, possibly due to new curves. A great starter kit although I'm still using this type a year on. Once you get to know your kit and know when the coils need changing its works great, for me it simulates smoking and I have now been smoke free for over a year. Very quick delivery as always. Very good product. Produces a decent amount of vapour and has given me no problems so far. Before i start it was gunmetal i bought not the one mentioned above. But yes very good vaper and doesnt leak if closed the right way. I bought this soon after my hoxton starter one as this you can change the ohm of the coils and when the 1.5 ohm ones need changing i will get the lower ohm coils for better heat and taste. Great site thanks. A great upgrade for those who started out on a simple pen like the blu but who want slightly more vapour without carrying around a great bit boxy vape. I'm very happy with it - returns a nice hit not dissimilar to richmond menthols when used with Websters One Pound Wonder double menthol. Remember to turn it off before you put it in your pocket or bag as the button is easily depressed and you can burn out the coil without realising. Once again really good product, well made and simple to use - this is my second one and I continue to be impressed by it. Easy to use, just what I wanted. Quick delivery. Thank you. The Ego A10 is a nice starter kit for the price and works well except it does make a very loud crackling noise which they have told me is normal but off putting when you inhale none of my other vape pens make this noise worrying I feel so it's going into the man draw for now. Good build quality, easy fill, no leaks and plenty of vapour. From cigalikes to pen style refillable tanks and also prefilled capsule styles. This is the best by far that I've ever had. Not having to take the unit apart because of constant leaking between battery and tank means it performs far better. No central canal in the tank that always filled up with liquid is also brilliant. I'm actually enjoying my vaping now rather than just getting my nicotine hit. Great vape starter kit. Purchased for my Wife and I'm that impressed with it will probably end up replacing my smok vape. Only down side is that the atomizer head takes up too much space so you have to replace e-juice more regularly than some other models. That being said it provides a great vape and tidy bit of kit. Hence the 4 out of 5 score. Great vape battery lasts a long time no leaks great air flow control decent amount of vapour great value for money ! A good product at a reasonable price for a beginner but you will surely want to upgrade soon. Had a bit of trouble with it a few days after receiving it, bit of spitback but rarely happened afterwards. The fire button is a bit wonky on the anniversary edition. Want to preface this by saying it’s not my first device. Previously an owner of Innokin T18, but looked into this due to the slightly larger battery size. Right from the off it was an awful experience: the first coil burned despite priming and The second coil flooded immediately on use. I’d clear it carefully and it would immediately flood again. On to the third coil. Due to the flooding of the previous coil I decide to not prime this one at all and risk a burn. Surprisingly, it was fine at first - and then it flooded. This time it spat liquid constantly upon firing. I’ll be going back to a second T18 or T20. After 5 years of searching and expense at last a vape that does what it says . It Doesn't leak !!!!!!! Perfect !!!! This is my second e-cig of this model for the last year and pretty happy with it. I have not smoked a straight cig thanks to this e-cig (I was a heavy smoker). Item doesn't work, fully charged, only flashing lights show. Faulty. Don't buy!